You are going to love this new kit to get you started on your way to a more youthful, glowing complexion. This multi-tasking body cream tightens, lightens dark spots, reduces wrinkles, and softens texture. Our serum-based correctors are concentrated in a pharmaceutical grade hyaluronic acid base. Plant-based, results-driven skincare with zero tradeoffs. Get more Clarity. Subscribe today. Thank you for subscribing to Clarity Rx. We believe beautiful skin means healthy skin. Combining our knowledge of skin with our passion for health, we made it our mission to create what others couldn’t or wouldn’t—plant-based, results-driven skincare with zero trade offs in terms of safety or efficacy. We’ve always been plant-based but results driven. Our focus puts nature’s pharmacy first. We unlock the performance of our natural actives by pairing them with conscious technology—and nothing more. No harmful or synthetic chemicals, extenders, fillers or bulk. No fragrance or artificial colors. No kidding. I Love working with your products, they truly make facials and retail more enjoyable. Beautiful!!!! I love it!!! Saw results the first day. Great product, however I wish there bottles were bigger. Love my new serum! Fine lines have already softened a bit. Sleep it off mask if my favorite. Wish it didn't irriatate my neck! I love ClarityRx in the treatment room and for my own home care routine! My skin feels hydrated, and soft. I love these products! Love these products. Natural and light weight that really work! ClarityRx has changed my skin dramatically!! I love all the products. Fabulous product line! I've seen outstanding improvements with my clients skin, as well as rave reviews on the ease of home care use. This products line is the best. I am using many of the products from your skin care line now after being introduced to them at Hand and Stone. I do like them and my skin seems to be doing well with the product line. I have been using ClarityRx for approximately 8 years. I love every product! The product is truly results driven. I have never used any product before ClarityRx that produced the results that I have expeienced with ClarityRx. I am very soon turning 69 years old and I love my skin. Thank you ClariyRx! I love everything about the products. Safe and friendly to use. This product line has changed my skincare life in the best way possible! Their Cleanse Daily always makes me skin feel so soft after cleansing my face. Also the way their Sleep if Off Mask just transforms my skin overnight is a godsend. Loving all the products. Pumpkin peel is awesome and Take It Off are both my go to's. The new packaging is causing some issues as it is hard to read, especially on the retail products. Remember that the treatment rooms are dark and if our clients are picking out products in retail and we aren't there, sometimes they are buying the wrong item. I love the Clarity products! I use Cleanse daily, get clean, brighten it, get fit, take care daily, take it easy, sleep it off mask and feel better! So many great products I can't live without! Great time. Learned a lot. Clarity RX is fantastic product, which I enjoy using and selling. The six step method for home care use is so helpful for my clients to follow. It takes the fear out of not knowing the steps when they start their home care regimen. I’m glad that Clarity decided to take the peels from %10 to %15. I would love to see 30 in the near future. Also, I enjoy Clarity RX training and I’m working my way to becoming a master. The one thing that I don’t enjoy is that it takes a full year to achieve this honor opposed to 4 to 5 months. It feels a little drawn out and long winded. Overall, I am pleased to be working with such a product. Love the clarity Rx red light! I am very proud to be a member of the Clarity family! Almost 4 years! From day one after launching my own business I knew from day one that I wanted to work with ClarityRx. After trying out Clarity products majority of my clients become fans for life. And it happens because these products really work, they were created with love to people and respect to needs of men and women, helping them become more beautiful and healthier. After each treatment I hand my clients a mirror and ask whether they are happy with the results and make sure to answer all the questions they might have. Almost every client says that their skin looks radiant and healthy. That is why I'd like to thank you on behalf of my clients too! Thank you very much for educating us as well. Your Advanced Education Courses and Master Esthetician Certification Program answer many questions that I face in everyday work and help me to improve my knowledge! You are the BEST! I have rosacea and ClarityRX has done wonders for my skin!!! I love it!!! Pro Power Peel from Dermalogica was one of the great classes. Always welcoming atmosphere in Trevose. When I have used Clarity Rx in my previous job I had nothing but amazing results. Every time I use one of the products it instantly hits my senses leaving a wonderful refreshing feeling. 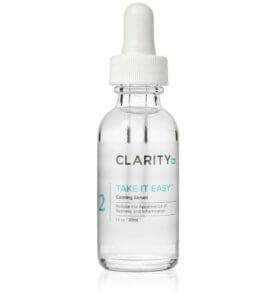 Clarity RX has really helped me tremendously with successful results to treat my clients concerns with their skin. I have been working with Clarity Rx for a little of a year amd have seen amazing results not only on myself but as well as clients. I have never had a bad reaction on anyone and will continue to point my clients to this line. These products are result driven with ingredients you know so you never have to worry about putting chemicals on your face amd have no idea what actually in the product. P.s. a little goes a long way. As a Master Esthetician I have used a lot pf products. Clarity Rx is still on the top of my list of favorites! Effective and natural! My skin has never looked better, I am so happy with this product. I find I need less makeup and some days choose to go makeup free because my skin looks so good! Currently using all clarity products. Cleanse daily and cleanse as needed at night. Easy on the eyes every day. Get fit serum for day and apple a day at night. Using Fix it once a week. Nourish your skin for my neck and decolletage . Rise and shine mask about 2xs a week! Best ALL NATURAL skin care line out there. Clarity is like a little GEM! DELIVERS results. My skin has never looked this healthy clear and smooth. Great skincare! The only line that doesn’t irritate skin. my order came promptly and correctly. just used the lip plumper once so far - just a small amount is needed for per application. will continue to use the product to see results. love the mission statement of this company! Clarity is a user friendly, responsible plant based product line. The products all feel and smell clean leaving my skin refreshed! Great service & great product presentation. Terrific products. You did a great job of formulating and packaging them. I’m using the Glycolic Cleanser, Oil Free Moisturizer and the SPF 50 sunscreen. Nice consistency and feel. The cleansers breaks down easy on my face! Would like a spot treatment if you don’t akready have one. Thx! As a skincare professional, I have been able to achieve long-lasting and visible results for my clients in accordance with complimentary home care. Thank you! Clarity RX your products are the BEST face products I have ever used for my daily face regimen!! I have been using Clarity RX for about 6 months and I absolutely love everything I am using! I have seen excellent results!! I feel like I have gotten that glow back in my face, wrinkles are disappearing, dryness in my skin has dramatically improved as well!! I wish I could afford to use every product that Clarity RX offers but I am currently using Nourish Your Skin, Daily Dose of Water, Restore It and Feel Better. A little goes a long way and I have only had to replace Nourish Your Skin and Daily Dose of Water over the last 6 months. 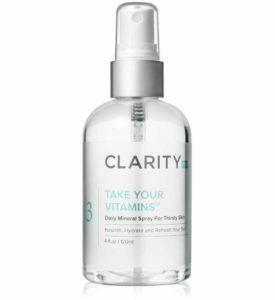 It was suggested to me that I try Clarity RX products from a very dear friend of mine who is an esthetician at Hand & Stone. I am so happy that I did!! Clarity Rx gives you tons of options for each skin type. Plus the price is reasonable . Julie. Always amazing costumer service and the best products! Call me in the morning is the best moisturizer I’ve ever used! The products are simple and effective. I absolutely love these products. I was first introduced to ClarityRX, when I got a facial at Hands and Stone. I love the feel of my skin and price. Thank you so much for these amazing products! I love it so much, the quality, effects and how you packed it. So impressed! Thank so much! Shipment was received quickly. Well packaged and l loved that samples and product information were included. Well done. Thank you! Love the products. Just wish they were easier to get! The best product quality...superior ingredients. Easy to use, great results! LOVE it! LOVE IT !! The products are awesome and the service is right on target. Keep up the great work.. The Best result driven skin care line ever! Great products for people with sensitive skin! I’m a ClarityRX girl!! Love my ClarityRX products! I am so grateful that I get to use Clarity Rx in the treatment rooms at my job. It is such a phenomenal line and I love everything that the company stands by. A few of my favorite selling points are made in the USA, created by a female, formulated without parabens, fragrance or sulfates. Such an easy sell for home care and my clients always leave so happy! I love Clarity products. This plant botanical derived skincare is effective in treating and improving various skin conditions, types and tones! I love clarity I wish there was a variety of cleansers. I love the ones now but maybe something more specific. Everything arrived on time and excellently packaged. The quality of the packaging has improved. I absolutely love this product I am 50 and I get so many compliments... I first learned of this product because I bought a raffle ticket and won some lol... then I googled the company to inquire about ordering... I will use for life my face is so hydrated and I had flaky dry skin over my eyelids and now they are perfect. I love the hydration spray on my face and cucumber mask and the face lotion! Only issue is my significant other ( boyfriend ) now uses my products... he loves them too. Fabulous product line. My clients love the results. I've always received very prompt and excellent service, I love this product line! Every month Clarity Rx shares its innovative products around the globe to help every person achieve both their beauty and healthy skincare goals. Check out our press section for live updates and news about ClarityRx and how we’re making women and men happier about the skin they live in. Join our ClarityRx Pro Club, offering both Introductory and Advanced Education Certifications. Our educational program provides extensive product knowledge classes to advanced cosmetic chemistry and other important skill-building courses from consultative and retail selling, to skin analysis, and more. © 2017 ClarityRx Clinical Skin Care, Inc.
Join our mailing list to receive the latest news and updates from Clarity Rx Clinical Skin Care.